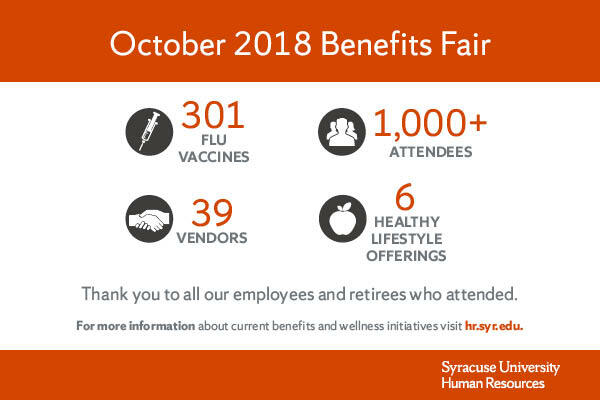 The Office of Human Resources welcomed more than 1,000 attendees at its annual Benefits Fair on Oct. 30 in Goldstein Auditorium in the Schine Student Center. The fair—open to faculty, staff and retirees—featured 39 vendors with information on health care, wellness, financial security, lifestyle enrichment, safety resources and diversity and inclusion resources. Flu shots were administered to 301 attendees. Open Enrollment is happening now through Nov. 9. Employees interested in learning about Syracuse University benefits may visit the Open Enrollment website at openenrollment.syr.edu. To update benefits information, individuals should log into MySlice.